Today Colin Beattie, MSP for Midlothian North and Musselburgh, highlighted legal protection that will be forthcoming for armed forces members who have received medals for valour. This follows a speech Mr Beattie gave yesterday in the Scottish Parliament in a debate entitled ‘Awards for Valour (Protection) Bill’. At present there is nothing in law to stop someone from duplicitously wearing a war medal they have not legitimately been awarded. Previous legislation was repealed in 2009 with the introduction of the Armed Forces Act 2006. 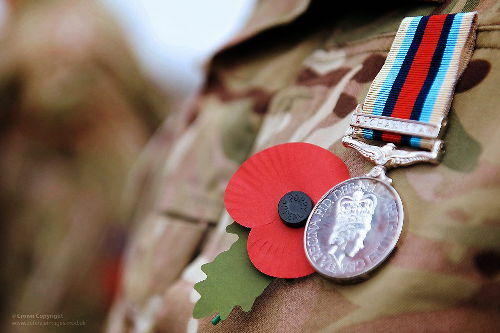 The Awards for Valour (Protection) Bill, which will cover the whole of the UK, will allow for a fine or potential imprisonment of up to 3 months for offenders who wear war medals to deceive. “I find it incredulous that there is no protection in law to stop someone passing themselves off as a war hero. “Members of our armed forces who have been honoured in service of their country should have the right to wear their medals and insignia proudly, and we the public should be able to recognise their brave achievements knowing that these are authentic. “Those who wear insignia – family members aside – without the right to do so devalue the courage of those awarded medals following their actions in battle. This is why I took the opportunity to speak in yesterday’s debate. For more on the Awards for Valour (Protection) Bill see here.